Republican presidential candidate Donald Trump told reporters Thursday that he attends a church in Manhattan, but the church released a statement saying the real estate developer is not an "active member." "I am Presbyterian Protestant. I go to Marble Collegiate Church," he told reporters in Greenville, S.C. Following Trump's announcement, the church released a statement to CNN about his affiliation. "Donald Trump has had a longstanding history with Marble Collegiate Church, where his parents were for years active members and one of his children was baptized. However, as he indicates, he is a Presbyterian, and is not an active member of Marble," the statement said. This follows his refusal to name a favorite Bible verse in an interview with Mark Halperin. Do you get it? Right-wingers love American wars. They love the military. Yet they backed a president (and vice president) who'd avoided service during a war, then plunged us into two more wars, including one utterly unnecessary and outrageously foolhardy war of choice. 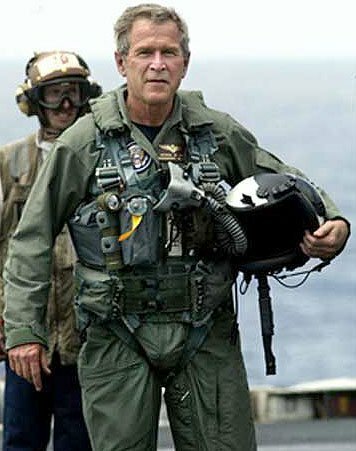 Right-wingers a decade ago didn't care that Bush and Cheney hadn't fought in Vietnam. Right-wingers propelled them to victory in 2004 against a guy who had fought and won medals. In fact, they mocked John Kerry's service. So they don't really care about whether a candidate or elected official has lived in accordance with their values. What they want is a candidate or elected official who will use their values (or, frankly, use anything) as a club to beat the people they don't like -- Democrats, liberals, immigrants, Muslims. At the peak of his popularity, George W. Bush did that -- he waged a war liberals opposed, and seemed to leave us speechless and sputtering with rage after he short-circuited the Iraqi inspections and attacked Iraq. And then he rubbed our faces in it with that plane landing and that flight suit. Trump is attacking immigrants, insulting women, and generally being an obnoxious, ignorant boor whose attempts to BS his way through questions (about his faith and other subjects, including the details of his policies) are so easy to see through that we can't believe he's getting away with them. And yet he is. He's getting away with them in large part because the right can see he's left us angry and speechless. But don't evangelicals care about God and faith? I'm not sure white right-wing Evangelicals in America really do care all that much. For many of them, Christianity is mostly a club they use to beat Godless liberals, the less fortunate, and non-Christians. What the faith seems to affirm for them more than anything else is the sense that humanity is divided into the good and the purely evil, and life's main task is to sort everyone into these two categories, and render appropriate punishments on the latter. This worldview isn't limited to God's judgment in the afterlife -- it extends to life on earth, which is why right-wing Evangelicals despise government efforts to aid anyone other than themselves and their kind (the "deserving"). So, in a way, Trump is embodying religion as they understand it when he threatens to round up and wall out immigrants, or bomb Muslims and seize Middle Eastern oil. He's taking things from the undeserving and giving them to the deserving. Isn't that what Christian conservatives think Jesus wants? UPDATE: There's a lot more on this subject at the Mahablog. Obnoxious, ignorant boor. The candidate who embodies Republican values. No wonder they love him. THAT'S the photo that sent a "tingle" down Chris Matthew's LEG! I like Chris, but will NEVER forget or Forgive him for that quote! For well over a century now, it's been impossible for any at all educated and functionally rational thinking non-insane human to honestly believe in and hold to a literalist interpretation of Middle East desert-originated Christian or Islamic monotheism, or indeed any flavor of religious doctrine, without a massisve assist from hypocrisy. It's actually MORE rational to believe that we and everything else in this Universe is a simulation. And I say this while recognizing that there exists a tiny fraction of a percent of people like Canadian theoretical physicist Don Page who've contrived for themselves an elaborate morality-based mind-palace in which they maintain their evangelical belief system without it interfering in how they adhere to science. Thy don't care about Trump's or anyone else's actual beliefs or actions as long as he says the right things and hates the right people. This article is the essence of hitting a nail on its head. ".....Christianity is mostly a club...". Bravo and, ironically, amen. WOULD CLINTON VS. BIDEN GET UGLY? NAHH. Is there any hope for Bernie Sanders? DID RICH LOWRY JUST HAND TRUMP A MEME? WILL TRUMP MAKE THE WAR PARTY EVEN MORE WARLIKE? HOWARD "BOTH SIDES DO IT" SCHULTZ? NO, THANKS.